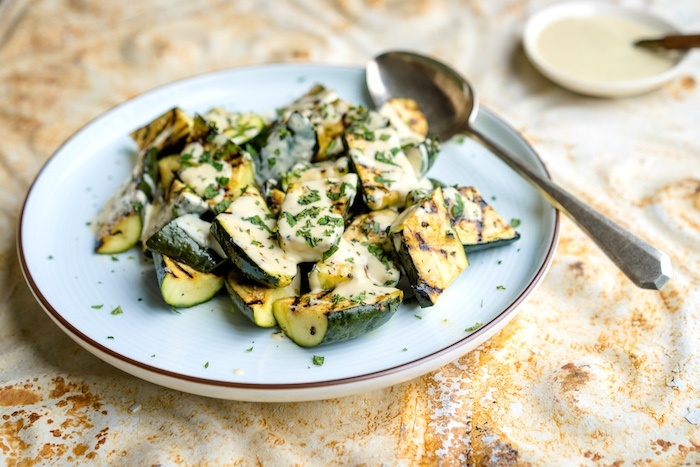 This zucchini salad pairs our Meaty Grilled Zucchini and a lemony Middle Eastern-style dressing (and you’ll want this dressing on pretty much everything) for a match made in heaven. You can make the dressing up to 2 days ahead, cover and refrigerate. Let it come to room temperature, before drizzling it over the squash. Whisk together first 6 ingredients in a small bowl. Cut the zucchini into 1-½-inch chunks. Arrange zucchini on a serving platter. Drizzle with dressing and sprinkle with mint. Serve with extra dressing on the side.